You are here: Home / Win a Kubota pedal tractor from Western Implement Company! 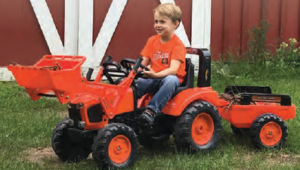 Win a Kubota pedal tractor from Western Implement Company! Enter below for your chance to win this Kubota pedal tractor for some lucky youngster this Christmas! Mike Murphy at Western Implement Company is making sure we have a pedal tractor to give away to some lucky winner this Christmas – enter below. NOTE: Only one entry per person will be considered.